One of the reasons why law students often dread multiple choice exams is that questions may have more than one possible right answer. 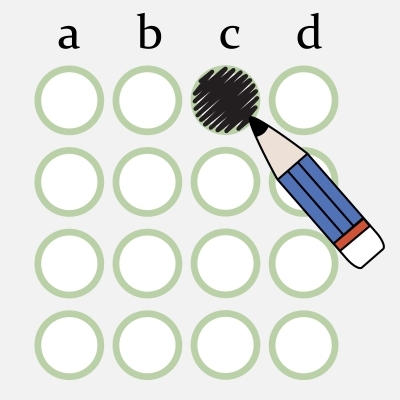 In fact, many multiple choice questions instruct the student to choose the “best” answer. There’s nothing more frustrating than choosing a seemingly “correct” answer but still getting the question wrong. First and foremost, always approach law school multiple choice questions by eliminating the wrong answers first rather than looking for the right answers. This may seem counterintuitive. But eliminating obviously wrong answers gets rid of answers that are distracting and may lead you astray. It also improves your chance of choosing the correct answer if you are not able to determine which answer is best and have to guess. Second, don’t just choose the first answer that seems right. Instead, make sure that you evaluate all possible answers and determine whether any other answer could also be correct. It’s hard to decide which one is the best answer if you don’t evaluate them all. Finally, if you narrow your options down to two possible answers, both of which seem right, then you should analyze which answer is best. One way to do this is by asking yourself which answer is more specific. If one answer is fairly general but the other is much more narrow in its application, the narrow answer is usually the better answer. If one references a general rule of law but the other incorporates very specific details from the question’s fact pattern, the detailed answer is probably the better answer. Ultimately, the key is to be methodical in your approach to evaluating the answers. Approaching each multiple choice question in the same way will help you solve the “best answer” dilemma.